Meadow Court was unlike any home in the East Coast at the time. It’s main attraction was the grand spiral staircase connecting the first and second floors. Meadow Court was considered such a lavish home that it appeared in an issue of “American Homes and Gardens” in the 1910s and attracted nationwide attention. 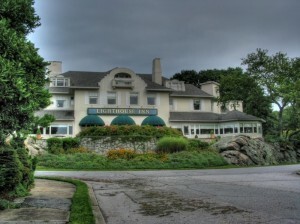 In 1927, Guthrie decided to turn his Summer home into a year-round inn, renaming the home from Meadow Court to Lighthouse Inn Resort, after the nearby Harbor Light of New London, now known as New London Ledge Lighthouse. Celebrities flooded to Lighthouse Inn Resort to get away from the busy lives they were accustomed to. Joan Crawford and Bette Davis are just two of the many names who frequently stayed at the inn. During the 1920s, social engagements, parties and weddings were held at the establishment. 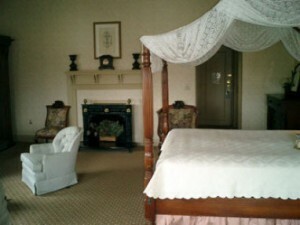 This is where Lighthouse Inn Resort’s haunted history begins. Though it has yet to be confirmed, legend has it that sometime during 1930, a couple had chosen Lighthouse Inn Resort as the location of their marriage. Not wanting to have any surprises during her wedding day, the bride practiced descending the grand spiral staircase for much of the day prior to the wedding. The combination of wearing a long flowing gown with high-healed shoes proved distastrous, as during one of her practice descends, she tripped, falling down the remaining stairs head-first and breaking her neck, killing her instantly. Since that fateful day, staff and guests have claimed to see a woman walking throughout the inn, wearing a wedding gown, only to watch her vanish before their eyes. Staff claim to have seen her as recently as just a few years ago sitting in the inn’s library as well as the room she apparently stayed in, now known as the Bridal Suite, the largest room in the inn. Some who claim to have had a run-in with the ghostly bride say they never saw her but instead felt a gentle breeze pass by followed by the scent of perfume. Another female spirit is said to reside at Lighthouse Inn Resort as well, though her story is yet to be told. 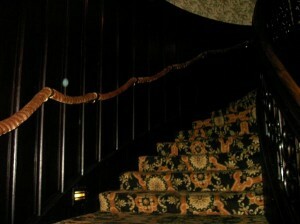 The spirit, according to numerous staff and guests, is said to be that of a young woman in Victorian attire. She has been spotted wandering the halls of the inn before she too vanishes. Aside from these two female spirits, there are also children who are said to still remain at the inn, even after their deaths. It is rumored that sometime during the early years of the establishment becoming an inn, two young children, a brother and sister who were guests at the inn with their parents, were playing outside during a thunderstorm. Lightening struck a nearby tree, causing a large branch to snap and fall on the children, killing them both. Guests claim to have heard children talking, laughing and running through hallways at night only to be told by staff the following morning that there were no children in the inn at that time. The final spirit associated with Lighthouse Inn Resort resides in the basement and seems to only negatively impact females. Female employees who have gone down to the basement to retrieve bottles of wine for guests have gotten sudden urges to vacate the area as soon as possible. Some say their hair has been pulled while down there. Male employees do not experience any negative feelings. Though Lighthouse Inn Resort’s haunted history is based entirely on legend, the number of personal experiences taken away by guests may lend some credibility to some of the stories associated with this location. It will not be known for sure who or what resides at Lighthouse Inn Resort without thorough paranormal investigations of the property. Unfortunately, Lighthouse Inn Resort had been experiencing financial difficulties and was forced to close its doors in 2008. Recently, a New Haven business owner purchased the inn at a public auction and is taking steps to reopen the establishment. There is no set date yet for the grand re-opening of Lighthouse Inn Resort but when it finally does open, it will invite a whole new crowd of guests. Only time will tell if claims of paranormal activity will persist in the 110-year old establishment. This entry was posted in Historical Locations. Bookmark the permalink.